Furthermore, in the article titled “War of words over shuttle diplomacy in Azerbaijan”, Azerbaijan’s Ambassador to Australia, Rovshan Jamshidov has admitted that gaining Australia’s firm backing in the Nagorno-Karabakh dispute was “one of the main reasons” for opening a Canberra Embassy in 2013. The article also quotes recent visitors to Azerbaijan as part of its government’s “shuttle diplomacy”, Federal Members of Parliament Luke Simpkins and Alan Griffin – the Chair and Vice-Chair of the recently-formed Australia Azerbaijan Parliamentary Friendship Group. Simpkins came under fire by the Armenian National Committee of Australia (ANC Australia) recently, when he rose in Australia’s Parliament to condemn the self-determined Republic of Nagorno-Karabakh as “illegally seized” territory belonging to the Aliyev dictatorship of Azerbaijan. This statement was delivered as a Constituency Statement, when The Australian confirms there are only four Azeri-born constituents in Simpkins’s electorate of Cowan. In MP fiduciary reports obtained by ANC Australia, it is confirmed all entertainment and accommodation expenses on these trips are covered by “the government of Azerbaijan”. Markarian commended The Australian on shining a light on this “questionable” form of diplomacy exercised by Azerbaijan. “We have tried to ask these questions to Simpkins, but he has avoided us. He couldn’t avoid The Australian, but yet, he still wasn’t able to answer the questions raised by its reporters and the Australian public,” said Markarian. The article “War of words over shuttle diplomacy in Azerbaijan” was printed on Page 4 of The Australian for 23 January, 2016. 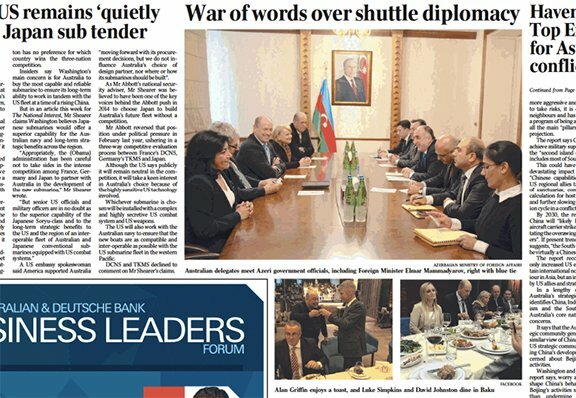 To read it online, visit http://www.theaustralian.com.au/national-affairs/foreign-affairs/war-of-words-over-shuttle-diplomacy-in-azerbaijan/news-story/cc00e1b58f8b21db3e9613aabbcd5f28.